PC-50 may be mixed into the PC-220, PC-220 SF, PC-440 or PC-440 SF base coating membranes. 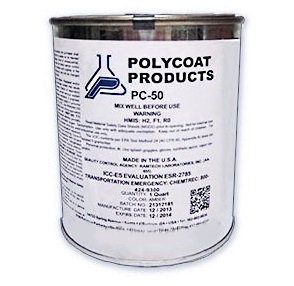 PC-50 is a single component, proprietary liquid thickener / cure accelerator for Polycoat Products base waterproofing membranes. This accelerator enhances the moisture curing characteristics which accelerates the cure time and causes the coating to thicken and cure quickly. PC-50 is designed to be used with the following waterproofing base membranes: PC-220, PC-220 SF, PC-440 and PC-440 SF.